I wonder if it's possible to change parameters for more than one keyframe without clicking every single frame. e.g. I want to let a dog walk. After letting him go I see, I have to keep his head higher. So, is it possible to select the keyframes of his head and change the parameters at once? At present, I have to click every single frame, change the values, click OK, go to the next keyframe, change... It's a bit onerous. I tried to let the dog walk with the Puppeteer. So I took a pose and wanted to mirror it, to make the walk cycle. But, when do it the way the say in the docs ( Symmetry) it doesn't work the way I expected. Could anybody please explain how to make it? I don't know a way of changing multiple frames at once, other than by writing a script. How is symmetry not working? What settings are you using? Have you used only the poses baked from Puppeteer, or are you using any AniBlocks? It had not selecte the whole Figure, only the hip - so it couldn't work. Beg your pardon for 'spamming'. I excpected that I have to script for the frame-selection. Puh, I'm not familar with it ( Python?) . Is it a lot diffrent to JAVA? I'm a bit familiar with QT. But I left it 'cause in my opinion it clusters a lot of data and swells up the cache. But in that time I was looking for a web-based solution, So it seems, that point doesn't matter at DAZ. So Thanks a lot for the hint. When I will ever understand the basics of DAZ I will look for scripting. It's the "Make your own pose offset aniBlock" video. 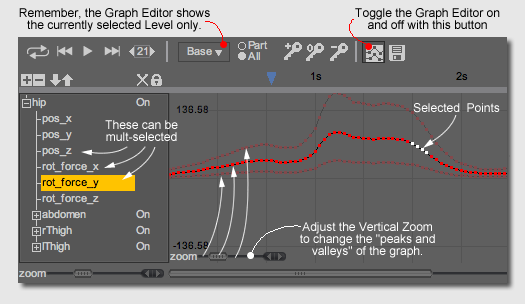 Also, if you have aniMate2, and you want to change it inside the block, then you can use the Graph Editor to drag over a range of keys, and then move them up or down. The picture shows from the manual - the selected points can be moved up and down, which will change their values over the selected range.